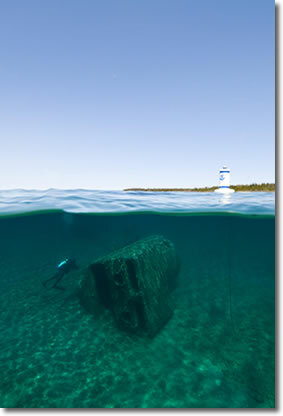 Explore the shipwrecks of the Thunder Bay National Marine Sanctuary. The crystal clear waters and our large 'glass bottom' viewing wells allow you to dive the wrecks - without getting wet! During our 2½ hour cruise you will experience magnificently preserved shipwrecks, scenic shorelines and majestic lighthouses. Learn about the history, legends and lore of Thunder Bay and many famous shipwrecks as you cruise the shoreline. Departing from the warm & friendly port of Alpena, the 65 ft. 'Lady Michigan' will take you on a comfortable adventure into the heart of Lake Huron's Shipwreck Alley. A memorable experience for passengers of all ages! Browse through our website for information about our cruise schedule, our tour boat, Thunder Bay National Marine Sanctuary, directions to our ticket office and more.